The Historic Ford Hangar, located at the Lansing Municipal Airport in Lansing, Illinois, is an airplane hangar built in 1927 by Henry Ford to connect his Ford Motor Company manufacturing plants in southland Chicago with his factories in Detroit and to produce and display Ford Trimotor airplanes. Ford purchased 1400 acres of farm land in Lansing, Illinois in 1923 to build his airport. Beginning June 1st, 1926, work began on clearing land to build the hangar which was expected to hold three of Ford’s Trimotor planes when completed. 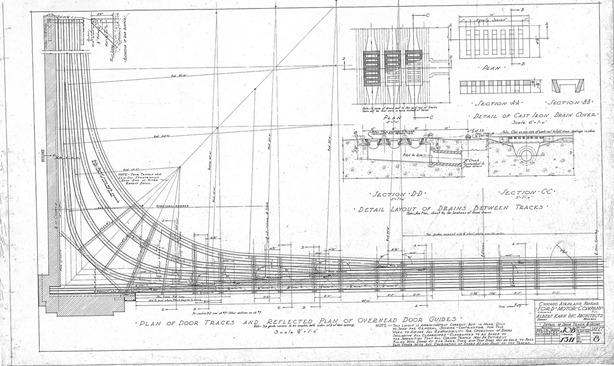 The noted architect, Albert Kahn, oversaw the design and construction of the building. He was Henry Ford’s chief architect and wanted to design a space that would solve a number of problems found in early hangars. He incorporated a number of innovations into the building that had not existed in airplane hangars prior to that time. In the early days of aviation, most hangars were often poorly designed, temporary structures that were not well lit. To solve this, Kahn incorporated three distinct features into the building. First, Kahn looked to improve the overall environment of the hangar by utilizing as much natural light in the building as possible. As a result, he incorporated five large 15 by 18 foot window openings that, when combined with the open sliding doors, allowed for natural light to reach about 40 percent of the total floor area of the hangar. 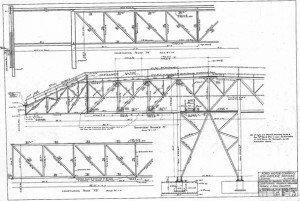 Second, he used an architectural technique known as cantilevered construction that allowed the interior of the building to be open without need for columns to support the structure, as well as reduce wind loads on the building. 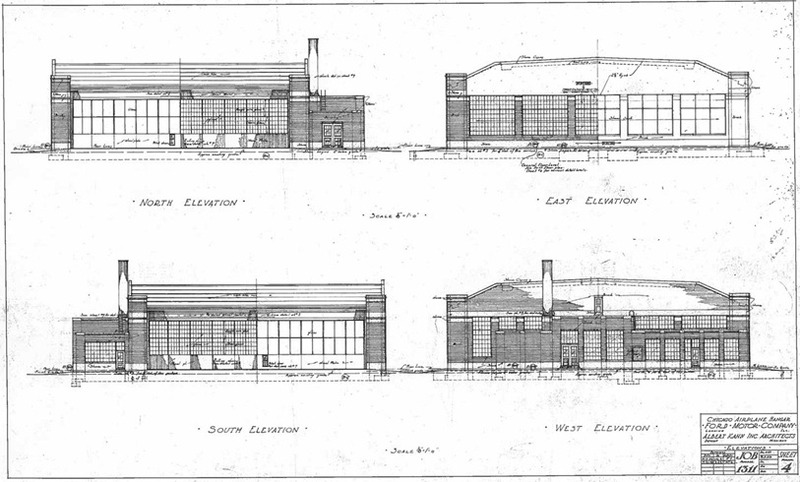 He also designed the hangar doors on the north and south elevations to be easily operated by just one person. Operating on a wheeled track located on the inside of the building, the doors could be opened to any length by one person, regardless of the current wind or weather conditions. The hangar, Kahn’s design and Ford’s dreams of Trimotor aircraft servicing the burgeoning commercial aviation travel industry of the time were ultimately hampered by the beginning of the Great Depression. During the 1920’s, Henry Ford’s airport in Lansing, hosted aviation notables such as Charles Lindbergh, and Wiley Post who used the airport to promote aviation in the United States. The postcard (below) depicts hangar tenants’ aircraft in the mid 1940’s. 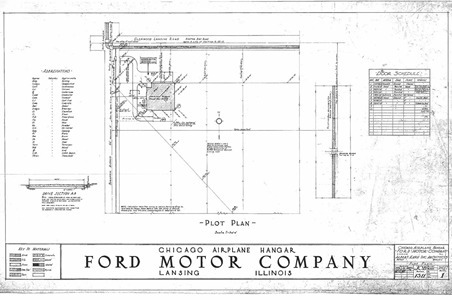 Ford stopped making airplanes by July of 1932, and rented the airport land and the hangar to his former airport manager Elmer L. Browne, and later the Hammond aviator Guy W. Amick. 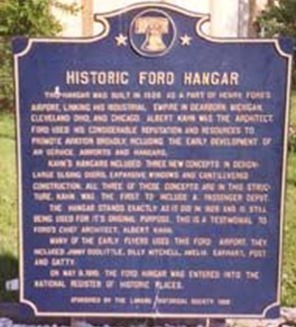 The Ford Hangar and the airport were acquired by the Village of Lansing in 1976 in order to qualify for federal funding for the Lansing Municipal Airport. It was established as a historic building on the National Register of Historic Places in 1985. The building continued to serve as a working hangar for a number of different aviation concerns until 2011, when it was vacated for preservation purposes. Efforts to assemble funds for the restoration of the building to its original condition for the benefit of the public are currently underway.